There is legitimate collective ownership, and there is illegitimate "collective ownership". The difference is consent. Not "implied consent", which isn't a real thing, but actual consent. If I join together with some people and we all chip in to buy a plot of land, and understand explicitly how the land will be used (or choose to not be involved in that decision), then the land is collectively owned. Great! There is Unanimous Consent; this makes this collective ownership legitimate. If I am told that because I live in a certain place, being born there, I have a share in the collective ownership of the whole region, including other people's private property, but that no one can opt out of the rules imposed on the land without moving away, this is not legitimate collective ownership. If someone I don't like, don't trust, or don't respect claims to have the "authority" to administer the land on my behalf, against my wishes, this is illegitimate. Nothing can make it legitimate without Unanimous Consent. This is a violation of property rights, not a way to express them. I see the graphic implying communism. 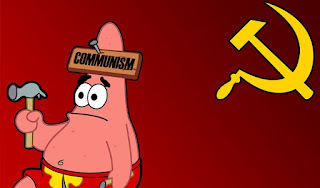 Communism is essentially a socialist system whereby a central authority distributes wealth equally, all based on a desire to avoid a ruling class or financial elitism. At it's core, it is simply pitching in on something that will benefit everyone equally and that is managed by a central authority. This works great if it is something voluntary like a charity function or people pitching in for some kind of benefit, like building a church or school or something. It can work for things like a mutual fund or medical insurance, etc. But as soon as coercion/force is applied, it becomes theft, robbing the rich to feed the poor until there are no rich and everyone is equally poor.